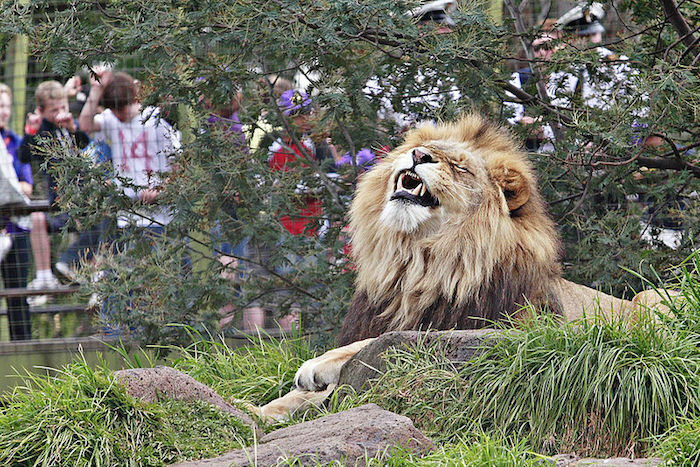 I had never heard a lion roar…until I visited the Berlin Zoo. Inside its cage, inside a heated building, it got up, paced, roared, paced, and roared. Went to its lioness, nudged it, licked it, paced and roared. People flocked to the enclosure snapping pictures; I got up on a bench to watch over the heads of the spectators. The roar, when the lion faced toward us, raised my hair on end. The huge head and mouth. The intensity of the sound. But here he was, old, slightly paunchy, pacing on the concrete, walking by the giant bones left for him to chew. How important is this “museumified” nature preserved in a zoo, a seemingly random collection of mammals, birds, and others for an urban ethic, now that humans are primarily urban dwellers? I saw condors with a wing-span of over eight feet, effortlessly deploying those awesome wings to fly twenty feet. The zoo itself was full of trees, like Berlin, and seemingly untended beds of weeds, along with a few cultivated flowers. Children, in various stages of late-afternoon meltdown, abounded. How do these types of experiences impact city dwellers? Is there a connection that is made between seeing these creatures, displayed in sometimes embarrassingly intimate ways, and living in a city in an ethical manner? How does one know? It is clear that before the industrial city, nature in cities was not prized. Think of the medieval city, hard-scaped and beautiful, with pleasing dimensions to plazas like that of Sienna in Italy. The scale was human, and Nature was right over the wall: wolves, bears, grasshoppers, and the plague. Its vagaries were quickly and intensely felt, feast or famine. As cities gained population and industrialized, there was a turn toward Nature: the planting of street trees, the creation of parks, the collection of fauna and flora from the world over to display in museums, botanical gardens, and zoos. The question remains as to whether this shift has ethical ramifications for human relations with Nature. It would appear that it might—in a perverse manner—as we now divide Nature into sacred and profane, at least in the United States. Sacred Nature we have preserved, ejecting humans out of ecosystems, informed by a notion that humans defile what was once pristine Nature, even though Indians had lived in and modified ecosystems for millennia. This Nature is curated and managed for attributes we feel are important. In the early 20th century, we managed these sacred spaces for ungulates; now scientific analysis has shown the need for predators, so we have reintroduced wolves and grizzly bears in the West. But beware if they transgress the designated boundaries. What is left—profane Nature—is free game for transformation and extraction. The sanctity of private property rights means that regardless of any intrinsic existence value, this Nature has only dollar value. Thus we continue to carelessly—cheaply and brutally—use Nature with little regard to long-term impacts. Still though, the impacts are impossible to avoid: water and air pollution, soil contamination, and perhaps the most unavoidable of all, climate change. Humans are impatient, short term, avid for pleasure. While these traits are not ubiquitous, it takes practice, intent, and cultural values to exercise restraint and parsimony. Capitalism does not thrive if people don’t consume, and consumption requires, by and large, things to consume, things that are made with products from Nature. Though we are highly connected and permeated with information and news, the devices we now rely on, for example, are made with precious metals mined in places like the Congo by large- and small-scale enterprises that exploit people and Nature with little concern. The consumption society is built on a pyramid of exploitation. Things are not priced near their true value because they do not need to be—Earth is still by and large free—and if they were, there would not be the kind of global affluence (amidst pollution and poverty), the world is experiencing today. Perhaps we could not be urban either. Cities are the vortex of the consumption of Nature. Nature’s products, inert minerals, metals, and ores and biological resources are mined, harvested, and transformed into urban infrastructure and consumption goods. In this sense, cities are concentrates, Earth distillates, with the parts we don’t use discarded into dumps, tailings, and polluted or contaminated residues. All the materials from asphalt to concrete, glass, wires, and cables are Nature, embedded in the infrastructure, to which is added the quotidian flows of water, electricity, gas, and goods, also from Nature. One might even say that cities are where there is the most Nature, transformed for our use, planted for our pleasure, essentialized for our wishes, wants, and desires, and most importantly, for economic activity. Yet, as we know, everything is connected to everything else, as John Muir so famously put it. That lion in the Berlin Zoo is an epiphenomenon of our relations with Nature; its gradual disappearance is a sign of the impoverishment of Earth. The biggest change we have been experiencing over the past century in our relations with Nature is one of intensity—intensity of extraction with the ubiquitous use of fossil energy—and of the acceleration of intensity. We are beginning to experience how everything is connected—climate change is global, and its impacts are inescapable. No longer can we move to a cleaner river, a more pleasant place; climate change cannot be avoided. Our true relationship with Nature is being revealed. Time and space are being further collapsed. It is hard to imagine how Nature could not be critical to a 21st century urban ethic, and maybe with the acceleration of change, and its greater visibility, different practices will emerge. Practices of cultivation of awareness and patience, of modesty and constraint need to be developed. Degrowth for the affluent in the West and a leveling are required so that Nature is given a breather and the excesses of affluence are curtailed. And so going to the zoo may then be a time to sit with the animals and learn grace in the face of limited options. Stephanie Pincetl is Professor and Director of the California Center for Sustainable Communities at UCLA’s Institute of the Environment and Sustainability. Dr. Pincetl conducts research on environmental policies and governance and analyzes how institutional rules construct how natural resources and energy are used to support human activities. She is expert in bringing together interdisciplinary teams of researchers across the biophysical and engineering sciences and social sciences to address problems of complex urban systems and environmental management.